One virgin + three wolf shifters = e-reader ecstasy. 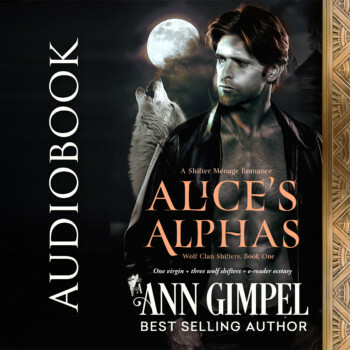 Alice’s Alphas: It’s 1936. Thirty-year-old Alice has given up on finding a husband. Between civil engineering and mountain climbing, her interests are so masculine, she scares men away. A poor route choice strands her—lost, hungry, and scared—next to Lon Chaney’s cabin deep in the Sierra Nevada Mountains. Jed senses a woman stumbling down the steep, inhospitable mountain behind his borrowed cabin. Her scent tantalizes and excites him. Mates are scarce these days, and if his nose is right, she’s his fated one. His and his two pack mates, that is, who are mercifully gone at the moment. Jed crafts a careful strategy, knowing the mate bond might not be enough to convince her to stay once she finds out it will link her to all three of them—forever. Alice adds Jed to her list of problems when he melts out of the shadowed darkness. At first she declines his offer of help, but he keeps talking until she ends up inside the cozy log cabin in front of a roaring fire. His skilled hands and a shot of whiskey heat her blood to molten, and her carefully tended world explodes into desperate hunger to make love with the man rubbing her weary feet. As caught up in lust as Alice, Jed takes a chance. A big one. Will mating with her before disclosing everything turn out to be a huge mistake?